A box full of wedding photos sits at Celeste Raspanti’s elbow. As she lifts one from the stack and looks at it, two brides, two grooms, two maids of honor and two best men look back. It’s a black-and-white image more than 99 years old, made of the wedding parties from a double wedding, the first of its kind at the “new” Cathedral of St. Paul on April 14, 1915. Raspanti, the volunteer archivist for the Cathedral, is gathering wedding photos of couples married at the cathedral for a special exhibit — “100 Years of Marriage at the Cathedral of St. Paul.” The exhibit will be displayed in Hayden Hall in the cathedral’s lower level during 2015, the 100th anniversary year of the first Mass in, and the simple dedication of, the cathedral. Opening is set for June 6, 2015, Archdiocesan Marriage Day. Couples and family members are invited to submit photos for the exhibit; more than 60 photos have already been received. A goal is to have a wedding photo from every year from 1915 to 2015,” Raspanti said. The exhibit is one of a handful of special events being planned to celebrate the centennial. Raspanti, a retired university history teacher and playwright, is chairing the centennial committee. She said one of the purposes for the exhibit is to support marriage. “We want to show the sacrament of marriage as we Catholics understand it, and to show the continuity of the sacrament at the cathedral,” Raspanti added. The wedding photo exhibit, like other centennial events, is an effort to fulfill the three-fold mission of the cathedral, she said. People from all over should feel a sense of ownership of the cathedral because it is the mother church of the archdiocese, Raspanti said. It’s also a parish, and fulfilling the mission of every parish to educate in faith and to minister to those in need, she said, and it has a public face with a mission to enrich the cultural life of the community. Catherine and Winifred O’Dowd talked about buying their wedding dresses and special shoes for their big day back in 1915. The O’Dowd sisters were married at the first double wedding in the “new” Cathedral of St. Paul April 14 of that year. Catherine married Gerald Fenlon, and, at the same ceremony, Winifred married Joseph Jolly. A photo of their combined wedding parties will be the first on display at the Cathedral Centennial Wedding Exhibit, set to open June 6, 2015, coinciding with the celebration of Archdiocesan Marriage Day. A priest at the cathedral, Father Walter Aloysius Daly, gets the credit for giving the O’Dowd sisters what they considered the honor of being the first double wedding in the newly dedicated church on the bluff of Summit Hill in St. Paul. Joseph Jolly immigrated to St. Paul from Montreal, reported Mary Ann Jolly, who married Joseph’s son, Don. Winifred, Catherine and Gerald Fenlon were immigrants from Ireland. The Fenlon and Jolly weddings weren’t the only ones that April Tuesday in 1915. 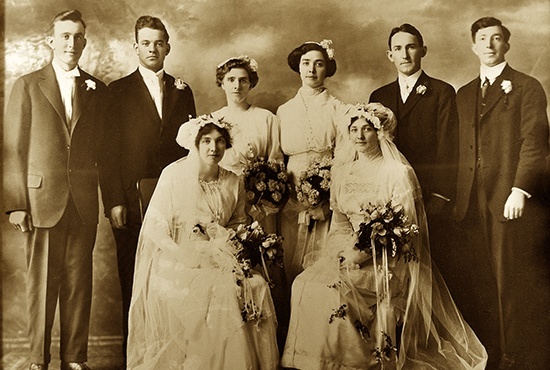 Daisey Rettinger and Adolph Schmit were married in a single ceremony that day as well, according to records of the Archdiocese of St. Paul. The Fenlons ended up joining other parishes later, noted daughter Eileen, the keeper of the family stories, but they always came to the cathedral for special occasions. 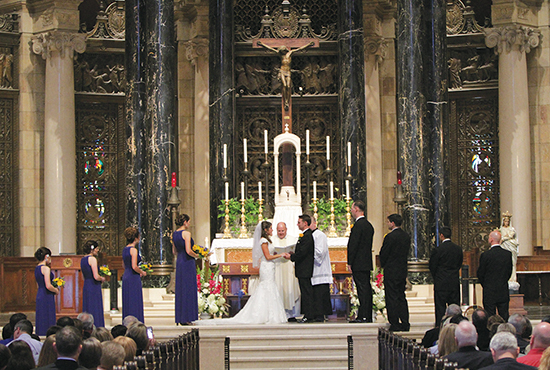 Submit your photos for the Cathedral’s exhibitTo submit photos from weddings at the Cathedral of St. Paul for the exhibit, get the submission form at http://www.cathedralsaintpaul.org/100-years-of-marriage. That web page has instructions for digitizing photo prints and other information, including a link for where to email the photos and any family stories related to the wedding. That email address is archives@cathedralsaintpaul.org.